Nor is there a stand with a clear mirror. Where, then, is a grain of dust to cling?" All this talk about clearing the mind, stopping thoughts, and contemplating the mind reminds me of the northern school of the pre Hui Neng era. It expresses an inferior understanding of the sutras. The school of sudden enlightenment teaches that there is absolutely nothing to clean or fix and that things are what they are; progress is just another illusion. "Nothing to learn and nothing to practice," but in your ordinary life you're coursing with the habit energy of past karma. Unless you can actually cultivate all three buddha bodies, then this is all lip-service Chan, because you have not been able to use any of this to transform the body and cultivate the Sambhogakaya. Huineng and the other Chan masters spoke of perceiving the Dharmakaya so much because it is the source and the basis, but even so, rebirth will not end until all three bodies have been cultivated. Only this counts as being complete. No amount of rhetoric in the world will make the difference if you have seen the Path, but then are helpless to use this truth to subsequently enter samadhi. Overall, I agree with what you've said, except the part about the kayas. When one realizes the Dharmakaya, one realizes the Rupakaya. The Sambhogakaya and Nirmanakaya arise out of the Dharmakaya and appear according to the karmas of beings to be tamed. The three bodies are inseparable. Agree. See, when you perceive the Dharmakaya as you say, you reach the source of everything; when you dwell in Dharmakaya, you are transformed by Dharmakaya and all "truths" and concepts such as rebirth, the three bodies, and so on start to melt and fade away: when the butterfly finally flies, the concepts and realities of the egg, the larva and the pupa lose their meanings (raison d'être) and cease to exist. Such transformation is achieved naturally and automatically; there is no conscious effort involved. I am not implying that religions, disciplines, and practices are useless. In fact, even though enlightenment happens spontaneously, practices and disciplines increase the chance to encounter enlightenment: it's like trying to crack the secret code of a lock or safe; the more combinations you try, the more likely you will find the right code to unlock the safe -- theoretically at least. Therefore, practices and disciplines are important indeed but one should know and remember that they are vehicles and not destinations. Pema Rigdzin wrote: Overall, I agree with what you've said, except the part about the kayas. When one realizes the Dharmakaya, one realizes the Rupakaya. The Sambhogakaya and Nirmanakaya arise out of the Dharmakaya and appear according to the karmas of beings to be tamed. The three bodies are inseparable. Nan Huaijin wrote: In China and overseas, those who lecture on the Chan School generally like to investigate meditation cases and then enter into critical theoretical discussions, and that's about all. However, if we wish to truly investigate the Chan School, there are three things that we must study: seeing the truth of the Buddha's teachings, cultivating realization, and carrying out the bodhisattva vows. You must therefore do meditation work yourself after you come upon the enlightenment teachings. Otherwise, it is useless. Without the actual practice of cultivating realization, to say someone is a Chan student or even understands Chan or the path to enlightenment is just plain lip service, and there's no way around this truth. Unfortunately, too many people hold the view that Chan is just some psychological game, or that they understand Chan when they can't even generate the lowest stage of samadhi. How can one deceive themselves into believing that they understand even an inkling of Chan if they haven't been able to generate samadhi, the most basic requirement for proficiency of the path? Even professors and experts who teach this material in universities feel it is only a matter of scholarship to be able to comprehend the matter. Intellectual reasoning is just another spinning of the sixth consciousness whereas the practice of meditation is the actual entry into the Dharma. Can you explain in your own words what it means to cultivate the 3 bodies? Just briefly if it is ok with you. Thanks. I've never heard of the term Rupakaya used to mean anything other than the Sambhogakaya and Nirmanakaya, but I guess one learns new things every day. Anyway, lemme rephrase: When you realize the Dharmakaya, you realize the Sambhogakaya and Nirmanakaya. I didn't say anything about samadhi; I said realize. "Therefore, the real Dharmakaya is just voidness. It is not necessary to seek anything whatsoever, and all who do continue to seek for something only prolong their suffering in samsara. Even if they were to practice the Six Paramitas for as many numberless kalpas as there are sandgrains in the Ganges River, they would still not reach the Supreme Stage. And why not? Just because such practice depends on primary and secondary causes, and when these causes separate, the practitioner of this path will still have only reached a stage of impermanence. Therefore, even the Sambhogakaya and the Nirmanakaya are not the real Buddha. Also, the one who spreads Dharma is not the real Buddha. In reality, therefore, everybody should recognize that only one's own Mind is the Original Buddha." Inge wrote: Do you know anything about William Bodri who runs http://www.meditationexpert.com, and his teacher Nan Huai-Chin? Ummm ......errrrrrr..."Meditation for a Beautiful Skin". As for the rest it looks like complete nonsense. actually meditation reduces stress, stress can create all manners of skin problems. To attain the Dharmakaya is to see the inherent nature of mind and reality. To attain the Sambhogakaya is to achieve the perfected body of manifestation with all its merits such as the 32 major marks, the 80 secondary marks, and the various samadhis and supernatural powers. And with the cultivation of the Nirmanakaya, it is possible to project countless transformation bodies throughout the various realms. On a simpler level, the three bodies can be seen as the essence, manifestation, and function of a buddha. How do you cultivate this at practical level? There is the gradual path of developing wisdom for dharmakaya and accumulating merits for rupakaya. However, Zen is the direct path of sudden enlightenment, seeing nature is becoming buddha as there is no buddha outside the mind. These are the fundamental doctrines of Zen, and while teaching different methods and paths is not incorrect they are part of the gradual teachings that ultimately lead to seeing nature and becoming buddha. Astus wrote: There is the gradual path of developing wisdom for dharmakaya and accumulating merits for rupakaya. However, Zen is the direct path of sudden enlightenment, seeing nature is becoming buddha as there is no buddha outside the mind. These are the fundamental doctrines of Zen, and while teaching different methods and paths is not incorrect they are part of the gradual teachings that ultimately lead to seeing nature and becoming buddha. What constitutes cultivating the 3 bodies exactly? I am waiting for his/her answer. I will not beat him/her up don't worry. Realizing the true nature of the mind, perfecting all manifestations in accordance with that, even up to the point where all beneficial actions are manifested through the pure functioning of the Dharmakaya without a single contrivance. Ok I am gonna try again by asking you: what do you practice exactly to realize the true nature of the mind? Do you practice? I hope I am being clear enough. 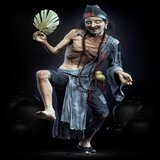 LastLegend wrote: Ok I am gonna try again by asking you: what do you practice exactly to realize the true nature of the mind? Do you practice? One realizes the Dharmakaya through meditation, self-cultivation, and the development of wisdom. Ultimately, Prajnaparamita. How could there be a fixed meditation or method associated with this? "Buddhism, Taoism, Hinduism and Christianity speak openly of this trio of principles or "bodies" that must be mastered for complete spiritual attainment. Whether we call this trio Father-Son-Holy Ghost, dharmakaya-sambhogakaya-nirmanakaya, essence-appearance-function, or Brahman-Vishnu-Shiva, they are all synonymous with the same set of principles." One is at the level of cause, the other is at the level of effect, so they are not necessarily in conflict. The point was that even after perceiving the Dharmakaya, there is still the cultivation of the Sambhogakaya and Nirmanakaya. This is why after realizing the Dharmakaya, some Chan masters were instructed to go off into the wilderness in order to continue their cultivation. Although they had "sudden enlightenment" (to the Dharmakaya), their "gradual" cultivation (of the Sambhogakaya and Nirmanakaya) was not necessarily complete. This is why people should not criticize the development of dhyana and samadhi, including through Esoteric School or Pure Land methods. longjie wrote: One is at the level of cause, the other is at the level of effect, so they are not necessarily in conflict. The point was that even after perceiving the Dharmakaya, there is still the cultivation of the Sambhogakaya and Nirmanakaya. This is why after realizing the Dharmakaya, some Chan masters were instructed to go off into the wilderness in order to continue their cultivation. Although they had "sudden enlightenment" (to the Dharmakaya), their "gradual" cultivation (of the Sambhogakaya and Nirmanakaya) was not necessarily complete. This is why people should not criticize the development of dhyana and samadhi, including through Esoteric School or Pure Land methods. In terms of Conduct/Concentration/Wisdom, Conduct is anything that helps lead to Concentration. For example, saying Namo Amitabha is Conduct. Treating everyone equally is Conduct. Going to work is Conduct. Maintaining precepts is Conduct. Doing housework is Conduct. Eating less, sleeping less is Conduct. Keeping my body from pleasures is Conduct. Conduct is a broad area of practice and is wholesome. Conduct is maintained within Buddha/Dharma/Sangha or accurately "Awakened/Truth/Purity." This means for example I should not involve in activities that will increase my anger, greed, and ignorance as these are not the opposite of "Awakened.Truth.Purity." I should always constantly look to find my mistakes and correct them and not at others' mistakes (essentially this is the first step in practicing in everyday life in every aspect). In other words, I should practice staying away from Greed/Anger/Ignorance and thinking and acts that benefit me, and think and act to benefit others (this is called "Awakened"). In terms of Conduct/Concentration/Wisdom, if you have one you will have the other two. For example, Hui Neng had Wisdom from instant enlightenment, he also had Conduct, and Concentration. Why? This is the Buddha and Bodhisattva's way. So they are teaching us their way. So we are following their way. So the three are inseparable just like "Awakened/Truth/Purity." For example, Hui Neng has "Awakened" from instant enlightenment, now had "Truth" and "Purity." For the rest of us, we need to start at either Truth or Purity. For example, Pure Land is entering through the door of "Purity" by cultivating Pure Mind. As for the three bodies, so far we have only one in flesh (the second body). By cultivating this body and Mind, if or when leading to enlightenment such as an Arhat, or rebirth in Pure Land, then we will have the three bodies. But to become Buddha one has to continue to cultivate the Dharma Body by breaking through the 41 levels of illusion. A Bodhisattva has achieved 1 level of Dharma Body, by definition...going back to cultivating body and Mind, by cultivating one is cultivating the other. The two are inseparable. For example, keeping the body away from pleasures involves body staying away from pleasures and Mind detaching from pleasures on the inside. Lastly, most of us will not become enlightened by hearing a few words like Hui Neng. So we need to hit the Sutras, Dharmas, and practice, and stay with Conduct/Concentration/Wisdom and "Awakened/Truth/Purity."